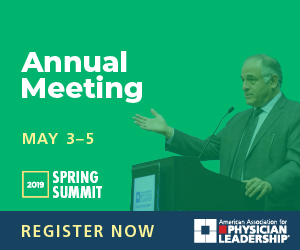 The Institute, slated for Oct. 25-29, features speakers, panels and breakout sessions addressing a variety of subjects for physician leaders and organizations looking to recruit them. Individual career management, organizational strategies for physician recruitment and retention, and wellness will be the focus of a comprehensive three-day career development program at the American Association for Physician Leadership’s 2018 Fall Institute at the Westin Kierland Resort and Spa in Scottsdale, Arizona. The journey from clinical to leadership success. Building support systems and professional relationships. An “Ask a Recruiter” panel session will provide perspective about what physicians want from prospective employers, and what employers should do to retain those they hire. The program also emphasizes individual wellness in relation to leadership and includes trainer-led morning exercise sessions (runs/walks, creative workouts outside of the gym, yoga, meditation and more) that can serve as a springboard for proper self and organizational care going forward. 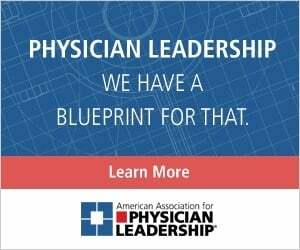 The Institute, of course, offers faculty-led live courses on various aspects of physician leadership, including the Fundamentals of Physician Leadership bundle.